which is strange, because there’s no way that it was too hot, since it was just booting up, and it wasn’t even warm in the room where I was doing the work. I was worried that maybe I had broken something during the battery swap, but luckily, it was just bad contact in the battery connector. 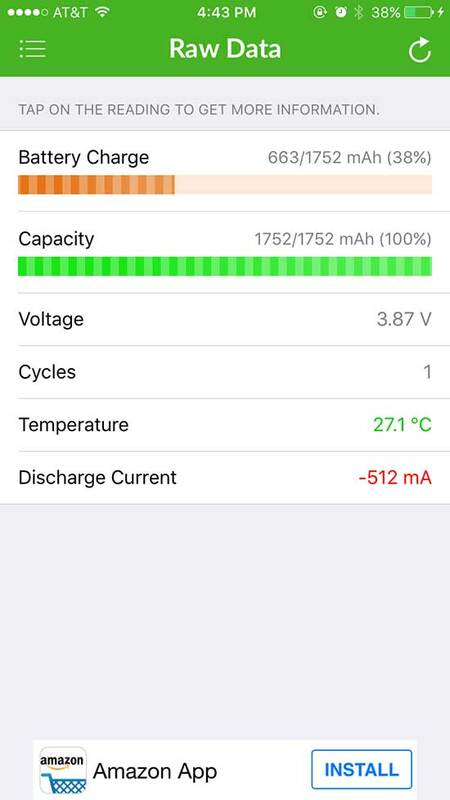 It turns out that there is a temperature sensor in the battery, and if it has a bad connection, then the iPhone will think that the battery is overheating. I tried pressing down on the battery connector, but that didn’t work. Next, I simply disconnected/reconnected the battery connector, and it booted up normally. Whew! 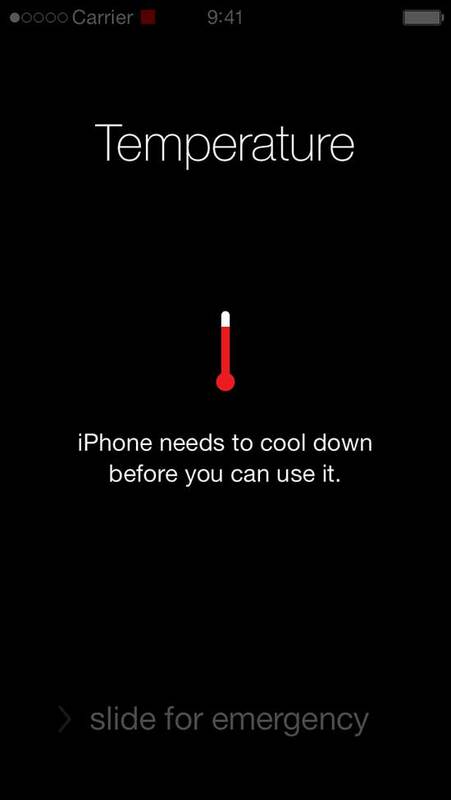 So, if you replace your iPhone battery, and it suddenly gets the over temperature warning screen, first check the battery connection. If the warning still won’t go away, but it goes away when you reconnect your old battery, then your new battery probably has a bad temperature sensor. To remove the screen, I simply attached a suction cup at the end of the screen near the button. Then, while pulling up on the suction cup just enough to make a gap between the bottom of the screen and the back, I slid a guitar pick into the gap, starting at the bottom, and working my way down the edges of the phone, pushing it in gently. You can feel the clips releasing as you push the guitar pick in, and the screen will start to pop out, clip by clip. In Step 6 of the iFixIt instructions, they don’t emphasize the need to release the clips. If you just pull up, you’ll probably damage some or all of them. I didn’t bother disconnecting the screen. In iFixIt’s instructions, they ask you to unscrew the screen connectors and completely remove the screen. Presumably, this is so that you don’t risk damaging the screen connector, lest you let it swivel back more than 90 degrees from the back. I didn’t bother disconnecting the screen, and instead, held it ajar with my left hand while doing everything else with my right hand. This is because the tiny connectors are very fragile in the iPhone, and I didn’t want to damage the screen connector when disconnecting it, or losing the screws (I had a very bad experience when I was trying to change the battery of my iPhone 4 a few years ago.. the replacement came with a connector that was very tight.. and when I tried to disconnect it, the whole socket broke off the PCB, rendering the iPhone useless). I don’t have a pentalobe screwdriver, and I don’t intend to buy one. I’ve successfully removed/replaced the screws at the bottom of several iPhones using a Xacto knife as a screwdriver. The tips of my #11 Xacto blades always break off, and the broken off tip fits perfectly into the pentalobe screws. The vendor I bought the battery from claimed that it would have zero charge cycle count, and it has one, but that’s close enough, so I’ll let it slide for now. The capacity is also at 1752/1752, as expected. Of course, these stats could be faked, but at least they appear to be OK, which is some piece of mind. Only usage testing will reveal whether or not I managed to buy a good replacement battery, or another dud. Update 20160804: So, it turns out that my phone was constantly running hot with the “hand picked” replacement battery I bought on Amazon. I highly recommend that anyone who replaces their battery on an iOS product check it with the free Battery Life app. I found out that the controller chip in the replacement battery was fake. The only stats that would change were the battery voltage and charge leve. The discharge current, temperature, capacity, and cycle count were fixed. After a month of using the battery, the Cycles were still 1! I contacted the seller, and they quickly refunded my money without asking me to send back the defective battery. Buyer beware!